A lifelong horsewoman and outdoor enthusiast, Jocelyn has been intrigued by the Mongol Derby and has followed it every year since first reading about it in Outside magazine in 2013. The Derby always been something in the back of her mind as a true adventure she could undertake someday. Jocelyn works full-time in the equine industry as the Associate Editor and Social Media Manager at Practical Horseman. Previously, Jocelyn was the Editorial & Media Coordinator at Equitrekking, the Emmy award-winning TV series and companion website at Equitrekking.com that “takes viewers horseback riding and active adventures around the world with local people to experience history, culture, and nature.” Equitrekking taught Jocelyn about diverse, horse-centered cultures, and she had the opportunity to interview and write about people and horses that lived in far-off places, including Mongolia, and covered topics that were important to her such as responsible tourism, equine welfare, crazy equestrian sports and adventure travel, to name a few. Pony express couriers in the making. Prior to working in the equine industry, Jocelyn worked for the U.S. Postal Service for 7 years, mainly as a city letter carrier in the “urban wilderness” where “neither snow nor rain no heat nor gloom of night” could keep her from her appointed rounds, and later as a delivery supervisor. 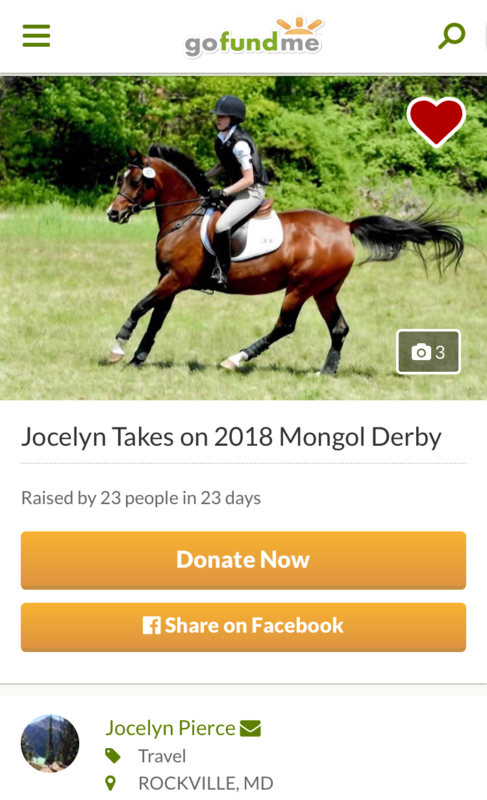 Since the Mongol Derby is inspired by the “pony express” system created under Genghis Khan in 1224, and there seems to be a lot of rain, heat and gloom of night, you could say Jocelyn has spent considerable time training for her pony express moment. Jocelyn received her B.A. in International Studies with a Minor in Photography and Concentration in Equine Science from Otterbein University. She completed an undergraduate dissertation titled “Meaning in Wilderness: The American’s Search for Identity and Consciousness Within Nature,” and tied it into a last-minute geology course that including a 10-day off-the-grid trip in the American West, where she studied geologic formations and dry camped. Jocelyn also earned a Globalisation and Diversity minor from Maastricht University in the Netherlands during a semester abroad, where she took advantage of her central location in western Europe for numerous solo trips, including hiking trips in the Alps. After college, Jocelyn realized she had seen more of Europe than the U.S., so took a 7-week, coast-to-coast cross-country trip (of which 5 weeks she traveled solo), exploring National Parks and camping along the way. Jocelyn and her mom on horse trek in Ireland. Other recent adventures include a multi-day horseback riding trek in Ireland and two weeks of hiking and riding split between Glacier National Park in Montana and Banff National Park in Canada. Jocelyn has been riding since the age of 4, and spent her childhood riding mainly Arabians in 4-H, hunters, dressage and even gymkhanas (in an English saddle) for fun. From age 5 until when Jocelyn left for college, she rode at the same small breeding and training farm where she learned about saddle-breaking and training young horses. Jocelyn got her first horse when I was 10, and she certainly wasn’t a suitable horse for a child. A spirited purebred Arabian mare, she had fantastic bloodlines, had been a halter champion as a two-year-old, was mistreated and finally came to the farm where Jocelyn took riding lessons as an unbroken and obstinate 12-year-old. Jocelyn and her homebred mare, Treya. Trust-building, countless falls and a few broken bones taught Jocelyn about patience, hard work and how to sit a buck. In addition to normal everyday shenanigans, Jocelyn and her barn-rat buddies did a lot of crazy things with their horses. They “jousted” with pool noodles, hooked the horses up to sleds with makeshift harnesses and lead ropes in the winter, rode over 10 miles to get ice cream cones in the summer and tried their hand at vaulting. With many years of adventures together and lots of disagreements along the way, Jocelyn’s mare decided she wasn’t so bad after all, and the pair became respectable competitors on the Arabian A-Circuit. Jocelyn competing on Otterbein University’s Hatrick. During college, Jocelyn rode on all three of Otterbein University’s riding teams: hunter/jumpers (IHSA), dressage (IDA) and eventing. It was here that she really fell in love with the sport of eventing. Jocelyn bred her stubborn mare during college and still owns the baby (now 11-years-old), who she saddle-broke and trained (a lot easier than saddle-breaking her mother!). They now compete in lower-level eventing.